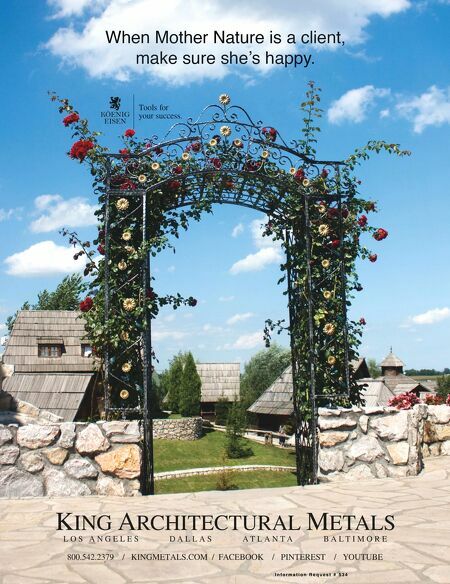 130 Landscape Architect and Specifier News Architectural Concrete Bases Traffic Signs / Mail Boxes Signage / Plaques Flagpoles / Lighting 2016 Specifier's Guide site amenities Flagpoles See Ads on page 115, 179 Information Request # 9039 ArtFORMS International, Inc. 905-642-3225 ArtFORMSConcreteBases.com ArtFORMS® cast-in-place Architectural Concrete Bases are a world-first-original concept (since 1992) for affordable, attractive, quality concrete bases for a broad range of building applications, including site lighting pole bases. 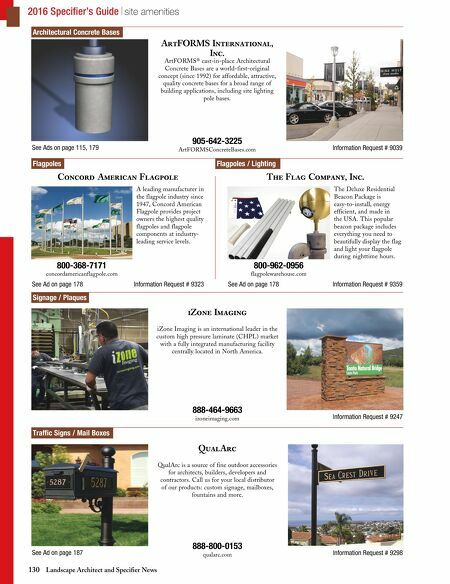 Concord American Flagpole See Ad on page 178 Information Request # 9323 A leading manufacturer in the flagpole industry since 1947, Concord American Flagpole provides project owners the highest quality flagpoles and flagpole components at industry- leading service levels. 800-368-7171 concordamericanflagpole.com The Flag Company, Inc. See Ad on page 178 Information Request # 9359 The Deluxe Residential Beacon Package is easy-to-install, energy efficient, and made in the USA. This popular beacon package includes everything you need to beautifully display the flag and light your flagpole during nighttime hours. 800-962-0956 flagpolewarehouse.com Information Request # 9247 iZone Imaging 888-464-9663 izoneimaging.com iZone Imaging is an international leader in the custom high pressure laminate (CHPL) market with a fully integrated manufacturing facility centrally located in North America. See Ad on page 187 Information Request # 9298 QualArc 888-800-0153 qualarc.com QualArc is a source of fine outdoor accessories for architects, builders, developers and contractors. Call us for your local distributor of our products: custom signage, mailboxes, fountains and more.